January 17, 2018 – San Antonio-class amphibious transport dock USS Anchorage (LPD 23) departed from Naval Base San Diego to conduct an Underway Recovery Test (URT) in conjunction with NASA off the coast of Southern California, January 17. 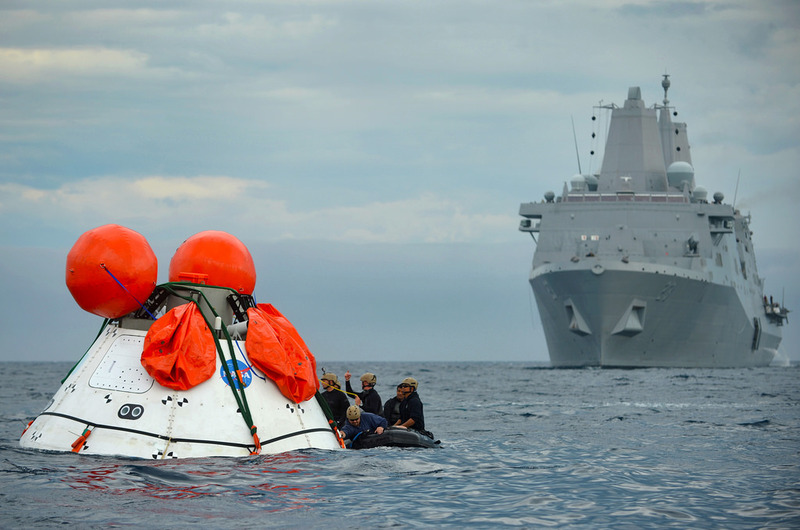 URT-6 is part of a U.S. government interagency effort to safely practice and evaluate recovery processes, procedures, hardware and personnel in an open ocean environment that will be used to recover the Orion spacecraft upon its return to Earth. This will mark the fourth time Anchorage will conduct a URT mission with NASA. Throughout the history of the program, a variety of San Antonio-class LPD ships have been utilized to train and prepare NASA and the Navy, utilizing a Boiler Plate Test Article (BTA). The BTA is a mock capsule, designed to roughly the same size, shape, and center of gravity as NASA’s Orion crew module. NASA and Navy teams have taken lessons learned from previous recovery tests to improve operations and ensure the ability to safely and successfully recover the Orion capsule when it returns to Earth following Exploration Mission-1 (EM-1), slated for December 2019. EM-1 will be an uncrewed flight, whose successful completion will pave the way for subsequent crewed missions and enable future missions to the Moon, Mars, and beyond. During URT-6, Anchorage’s specially trained bridge team will be on watch while the ship conducts restricted operations. Small boats carrying Navy divers and NASA’s recovery team will maneuver alongside the BTA to rig tending lines, guiding the capsule to Anchorage as the ship safely operates on station. Conducting both daytime and nighttime recovery operations, NASA crew members will work alongside the Navy to manage how the capsule is brought in, set down and safely stored. NASA plans to conduct three more URT missions before the launch of EM-1. Anchorage is homeported in San Diego and is part of Naval Surface Forces and U.S. 3rd Fleet. U.S. 3rd Fleet leads naval forces in the Pacific and provides the realistic, relevant training necessary for an effective global Navy.